Designed for seaming and overlocking sweater knits, this little workhorse does triple duty making/attaching piping and sewing stranded pearls and other trims. All of these are made possible by the large “tunnel” under the foot, which allows bulky edges and cords to pass easily under the presser foot. 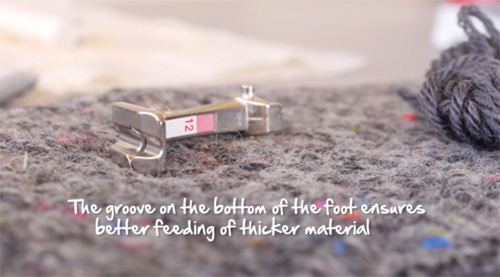 Here’s a short video showing how to seam knits, make and cover piping, and attach stranded pearls, all with Bulky Overlock Foot #12/12C. Next Next post: How to Make Jo’s Zipper Tape Rose on Your Sewing Machine – NO Handwork!